Earth is making loud groaning, screeching and popping noises which people are recording around the globe. I have a theory that I have no credentials to have. We have heard that the unusually angry Sun is warming up and expanding the core of the Earth, as it is other planets. This may be cracking the crust, permitting water in the crust to come in contact with the molten mantle. This may be the popping noises as drops of water do when they fall on a very hot surface as the water immediately expands 1600 times its normal volume as it turns to steam. The moaning sounds are the steam escaping through constricted areas of the earth as a kettle whistles when the water in it turns to steam. Nature is groaning in travail for what it is about to bring forth -- hell on earth. The blood of innocent Abel cried to God from the earth. Think of the murders of Christians and babies around the world. Whether my theory turns out to be anything more than childish thinking, we know from scripture that God is going to show His displeasure with sin by natural catastrophes coming from the earth. If these noises are truly happening mostly during daylight hours, as was said on at least one video, and around the globe, it has something to do with the Sun's effects on Earth. Obviously, its rays enter the poles of the magnetosphere and warm the earth from within but that is continuous, not just daylight hours. The Sun also warms the surface of the Earth in daylight which could expand it to help magnify this process. Microphones in the ocean have been telling us that the noises the Earth makes are now becoming constant as plates are moving to relieve the pressure. I expect even more volcanoes and earthquakes than we are having now, to help relieve this pressure. (Heb.12:26) whose voice then shook the earth: but now he hath promised, saying, Yet once more will I make to tremble not the earth only, but also the heaven. (Mar.13:8) For nation shall rise against nation, and kingdom against kingdom; there shall be earthquakes in divers places; there shall be famines: these things are the beginning of travail. I am sure there are some scientifically wise people out there who can enlighten me. One theory I heard was that the mantle is slipping and making the noises. One day we will know. Probably before then, we will have to be holy to escape the judgment of God for sin. Strange Sounds Proven by Scientist - Massive Effort to Cover It Up? An accredited and renowned scientist, Dr. Elchin Khalilov, has confirmed the strange sounds are not just a hoax and offers some solid explanations. Dr. Khalilov is geophysicist who works in the area of geodynamics and geotectonics. Basically he studies the way the plates of the Earth move on a global scale and the key dynamics of earthquakes and geological forces. In a recent interview for GeoChange Journal Dr. Khalilov was asked some questions about the strange sounds people have been reporting for the past few months. Here is a snippet from that interview. What is the nature of the unusual very low-pitched sounds reported by a great number of people in different parts of the planet since the summer of 2011? Many call them "The Sound of the Apocalypse". Information about that comes from all over the world: US, UK, Costa Rica, Russia, Czech Republic, Australia, etc". DR. KHALILOV - "We have analyzed records of these sounds and found that most of their spectrum lies within the infrasound range, i.e. is not audible to humans. What people hear is only a small fraction of the actual power of these sounds. They are low-frequency acoustic emissions in the range between 20 and 100 Hz modulated by ultra-low infrasonic waves from 0.1 to 15 Hz. There can be quite a lot of causes why those waves are generated: earthquakes, volcanic eruptions, hurricanes, storms, tsunamis, etc. However, the scale of the observed humming sound in terms of both the area covered and its power far exceeds those that can be generated by the above-mentioned phenomena". The entire interview can be found on one of his websites here. Is There An Effort to Poison The Well? There is no doubt a huge amount of fake "Strange Sounds" videos saturating YouTube; But where did all these fake videos come from? Between January 13th through the 16th I watched in disbelief as several dozen fake videos under the title "Strange Sounds" were uploaded to YouTube at the rate of 4-5 per hour. 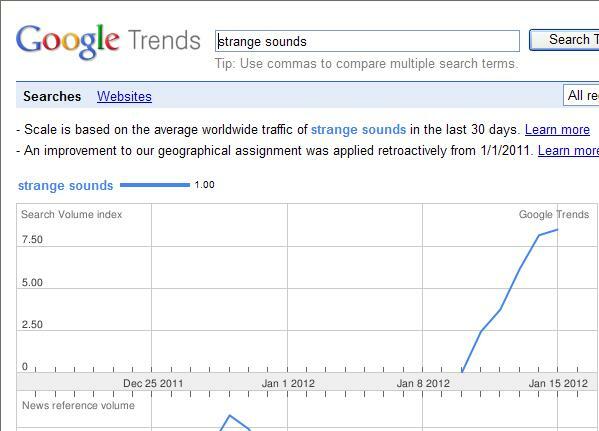 Notice that the graph for Google Trends starts shooting right up on the 10th when people actually started searching Google for the term "Strange Sounds" and then around the 13th is when all the fake videos started being uploaded like they were going out of style. In my 18 years on the internet and 6 years being an avid YouTuber I have not seen anything that even comes anywhere near close to this. Either we just witnessed the world's largest coordinated hoax that should be put in the Guinness Book, or somebody is trying to cover something up. If a person, or group of persons, wanted to cover up something as big as strange ominous sounds in the sky, and they wanted to do it in the age of digital cameras, the only way to be able to accomplish that goal is by creating a massive slew of fakes and injecting that poison into the stream of information, thus discrediting all the videos. There is no other possible way to cover up something like that unless you shut down YouTube or delete user accounts but if you shut down accounts that causes a whole other problem because then that lends credibility to the video uploader. The best, easiest, and "least messy" method would be to saturate YouTube with so many fakes that nobody could tell what was real and what was fake without extensive time consumption and effort. If a person was to try and sift through all the videos, probably now well over 100, it would be a nightmare. Poisoning the well is a rhetorical device where adverse information about a target is preemptively presented to an audience, with the intention of discrediting or ridiculing everything that the target person is about to say.